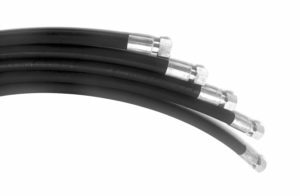 Due to our fast development on the Polish and European markets, we manufacture ready-made hydraulic wires. We mainly focus on the mass production of 1SN and 2SN hoses, as well as supplying 4SP, 4SH hoses, industrial concrete pump hoses, sandblasting and plastering. Our qualified staff is able to make every wire according to the technical drawing or specifications sent by the customer. We have high-class equipment for crimping, cutting, measuring and checking the wires. The proof is the lack of complaints and customer satisfaction of the service. After many years of cooperation with our clients, we also help in choosing the right hoses.We have been trusted by many companies on the industry market, and as a result, our number of customers are constantly growing.